Can you smell it in the air? NFL football, new shows, returning favorites and special events...it must be Fall TV Season! 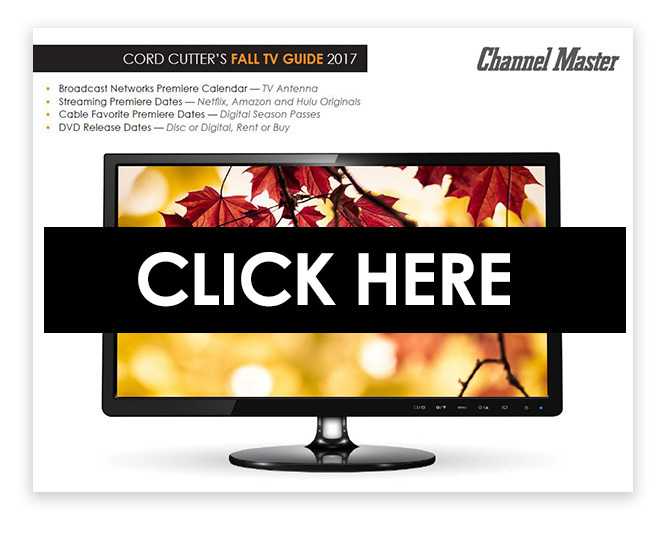 We don't want you to miss anything, so we've prepared this handy Fall TV Guide for cord cutters that lists all of the major Broadcast, Streaming, Cable and DVD premiere dates. It's free. Download, print, and stick it on the fridge. You're welcome! The combination of a TV antenna and streaming media player provide everything you need to enjoy the best of both live and on-demand TV. Your TV antenna provides all of the major broadcast networks for free in stunning HD, including ABC, CBS, FOX, NBC, PBS and The CW. That includes daytime, prime time and late-night programming as well as your local news and sports. For more details on what you get from a TV antenna, read our appropriately-titled post "What Do You Get From A TV Antenna?". You can purchase season passes from Amazon or VUDU to watch current episodes of your favorite Cable TV shows, and there's lots of original programming to discover from Netflix, Amazon Prime and Hulu if you subscribe to any of those services. Don't forget all the great DVD releases coming for fall - VUDU and Amazon have got you covered. To learn more about what type of TV antenna is right for you, use our Antenna Selection Guide. Don't get sucked in to paying more than you should for an antenna. Be sure to check out our post "There's No Such Thing as an HD Antenna." The broadcast signal is digital/HD, not the antenna itself. An antenna from the 1970s will receive the same pristine digital signals as any antenna you can buy today.